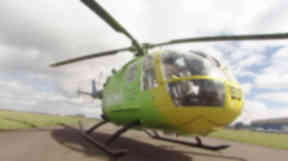 The Helimed 76 helicopter reached the operational landmark just eight months after it was launched. Scotland's Charity Air Ambulance (SCAA) has flown its 200th mission, operators said. The helicopter, with the call-sign Helimed 76, is based at Perth Airport and reached the operational landmark just eight months after it was launched in May 2013. Unlike the two Government-funded helicopters operating in Scotland, the SCAA helicopter relies on donations from the public, trusts and private and corporate donors. It flew its 200th mission on Sunday when called out to a riding accident in the Clyde Valley. In total, the ambulance has flown more than 17,800 miles over 150 hours. SCAA chief executive Gavin Davey said: "It's only one more helicopter but the difference it has made right across Scotland has been huge. "The number of people who have come back and said their lives have been saved or their quality of life has been improved by the service we bring is amazing. So we're very, very pleased." The charity air ambulance is now established as a key element of Scotland's nationwide emergency response network. More than half of its workload has involved serious trauma cases. Lead paramedic John Pritchard said: "We're totally pleased and proud that we have attained the 200th mission, especially since we haven't even been running a year. "We have made sure we've done a lot of cross training with the other emergency services and we're getting to know everybody. When we land it's great, the welcome we get is really good and we would like to keep that going in that way." The SCAA costs £1,500,000 a year to run, and Mr Davey said the Scottish public have responded "tremendously" in raising funds to keep the service in operation. He added: "Initially, it was largely around this area but now it's spread out to the whole of Scotland so when people see us in the press or on TV or see us picking someone up, they respond very well and hope that continues." For more information on the service, or to make a donation, visit the charity's webpage.